Duke forward Brandon Ingram works out in preparation for the 2016 NBA Draft in New York City. A late bloomer physically, Brandon Ingram got somewhat of a late start compared with other prospects in his class, only standing 6'2 as a high school freshman. He shot up almost eight inches over the next four years, but didn't establish himself as one of the very best prospects in his class until the end of his high school career, when an outstanding showing at the McDonald's All-American game and practices led to an invite to the Nike Hoop Summit following an injury to Henry Ellenson, the first call he had received from USA Basketball up until that point. It was at the Hoop Summit that we saw the first public measurements on Ingram, with his 7'3 wingspan and 9'1 ½ standing reach that is more like that of a NBA center than the small forward position he's mostly projected at. Still, at 196 pounds, the then 17-year old had (and still has) a long ways to go to fill out his lanky frame, something it looks like he should be able to do with his wide shoulders. The same can be said about Ingram reaching his athletic upside, which is very much a work in progress as it often is with players who hit late growth spurts. Ingram is extremely fluid for a player his size, possessing long strides and nice quickness getting off the floor, but does not show elite explosiveness at this point in time, struggling to turn the corner or finish above the rim through contact. Gaining strength in his lower body and core will be extremely important in unlocking his abilities as a creator, finisher and defender, as he's still in the gangly physical phase prospects in his mold often have to get past to reach their full potential. Nevertheless, Ingram played a substantial role for Duke this past season, one of the elite offenses in college basketball. 44% of his possessions came off isolations, pick and rolls (as the ball-handler), hand-offs and transition opportunities according to Synergy Sports Technology, which is more similar to the profile of most guards than your typical forward. While playing primarily power forward defensively, Coach K utilized Ingram as his primary creator at times, using his long strides to attack in the open court off defensive rebounds, as well as his ability to handle the ball and operate in one on one situations in the half-court. Ingram's high skill-level starts with his jump-shot, which was extremely reliable all season long, making 41% of his 3-pointers on nearly 200 attempts through 36 games. He's most dangerous with his feet set, hitting 42% of his catch and shoot jumpers on the season (1.247 PPP, 3rd best among all draft prospects behind Buddy Hield and Jamal Murray), as he has fluid and consistent mechanics, a quick release, and is very intelligent about the way he moves off the ball and finds open looks. Ingram has significant potential as a shot-creator as well, as he's an impressive ball-handler at his size, showing terrific footwork, and big, rangy strides attacking off the dribble. He mixes in jab-steps, shot-fakes, crossovers and hesitation moves to create space off the bounce, as the threat of his jumper means he needs to be respected at all times from the perimeter. It helps that he is both a willing and able passer, seeing the floor well at 6'10, being highly unselfish, even to a fault at times. As he continues to add strength, Ingram will be a significant mismatch for NBA defenses, as he's simply too big for most wing players, and too skilled for many power forwards in small-ball lineups. He can rise up and hit jumpers over the top of the defense if they back off him or use a smaller wing to try and slow him down, or go to work off the dribble with a more traditional big man checking him, finishing creatively around the basket from different angles using his length. Improving his ability to make shots off the dribble will be a major key in becoming a go-to guy potentially at the NBA level. He shoots a somewhat flat ball, converting just 30% of his 80 attempts this season. His lack of strength and explosiveness made it easier for defenders to get up in his body and knock him off his spots, and he can't always turn the corner and rise up over defenders at this stage of his development, looking somewhat upright with his very long legs, high hips and narrow lower body. Ingram struggled to finish around the basket at times against higher level competition, converting just 48% of his half-court looks inside the paint on the season overall (SST). He got to the free throw line at just a decent rate (5.6 per-40), and surprisingly struggled at times once there, making just 68% of his attempts. While he showed the willingness to go into the post and use his size and footwork, mostly to shoot smooth turnaround jumpers, he simply doesn't have the strength to operate in there consistently at this stage. Defensively is where Ingram surprised many this year with his underrated combination of toughness and competiveness. While his fundamentals need work, his size, length and reach gives him great versatility when paired with his willingness to get stops. He showed the ability to switch out onto guards effectively at times out of pick and rolls from the power forward position, sagging off and staying in front, while still getting a hand up to contest thanks to his 7'3 wingspan. With that said, Ingram still has a ways to go to become a more consistent defender, something that clearly didn't become a priority for him until arriving in college. He can get a little sleepy at times and lose his focus, closing out lackadaisically, standing around off the ball and looking hunched over in his stance guarding the perimeter. Duke had one of the smallest rotations in high major college basketball and couldn't afford for Ingram to get in foul trouble, which didn't always lead to him operating with the highest intensity at all times. Once again, getting stronger will help, as he tends to get caught up on screens quite a bit on the perimeter and can get pushed around inside the paint. Ingram has some other things working in his favor that should contribute significantly to him reaching his full potential. For one, he's the youngest collegiate player in this draft, not turning 19 until September. He could easily still be in high school, as he's younger than eight of the players who competed at this year's McDonald's All-American game. He draws rave reviews from everyone he's been around for his work ethic, character, and competitiveness, and is by all accounts the kind of person you'd like to build around for those who value team culture, being described as a a no-maintenance guy by his head coach at Duke. While he had a tremendous freshman season, being named ACC-Rookie of the Year and Second Team All-Conference, he doesn't appear anywhere close to reaching his ceiling. Few projected Ingram to get consideration as the #1 pick before the season started, but that's exactly what he did with the rapid improvement he made. This article was originally published on the Vertical on April 1st. Find it here in it's original format. The last comparison seemed like a pipe dream. At the time, Ingram was two inches shorter than Durant and was hardly considered an elite-level recruit. A career path somewhere in between Daye and Prince appeared to be most realistic. In the 18 months since, Ingram has accomplished the following: He grew two inches, ascended to the fourth-ranked player in the 2015 recruiting class, helped lead a ho-hum Duke team to the Sweet 16 and cemented himself as the potential No. 1 pick in the 2016 NBA draft. At 6-foot-9½ with the standing reach of an NBA center, an excellent handle, the fluidity of a guard and the stroke of a sharpshooter, the Durant comparisons look less and less ludicrous. Here's a breakdown of how the Kinston, N.C., native compares to one of the best basketball players in the world when he was entering the NBA.  Playing his entire freshman season at Texas at age 18, Durant  born on Sept. 29  averaged 25.8 points, 11.1 rebounds, 1.9 steals, 1.9 blocks, and 35.5 minutes in 35 games. He became the first freshman in NCAA history to be named National Player of the Year.  According to the DraftExpress Database, which dates to 2000, no other freshman has ever averaged 25 points per game on 50 percent shooting from 2-point range and 40 percent shooting from 3-point range (at least six attempts per 40-minute pace).  Durant scored 30 points or more in 11 of his 35 games.  At age 18, Ingram  born on Sept. 2  averaged 17.1 points, 6.8 rebounds, 1.9 assists, 1.1 steals and 1.3 blocks in 34 games playing 34.2 minutes per game.  Ingram is the only sub-19-year-old player in the DraftExpress Database to average at least 20 points, two assists, eight rebounds, and 2.5 3-point makes per 40 minutes while shooting better than 40 percent from 3-point range.  Ingram scored 25 points or more in seven of 34 games but never topped 30 points. 2006 Nike Hoop Summit (17.5 years old): 6-9 barefoot, no weight given, 7-4 wingspan, 9-1/2 standing reach. 2015 Nike Hoop Summit (17.6 years old): 6-8 barefoot, 196 pounds, 7-3 wingspan, 9-1 1/2 standing reach. More than 14 months later at the 2007 NBA predraft camp, Durant measured 6-10 1/4 in shoes with a 7-4 3/4 wingspan and 9-2 standing reach and weighed 210 pounds. According to the DraftExpress Database, Durant is the only non-traditional big man in the NBA with at least a 9-1 1/2 standing reach. Ingram will be the second. (There are no official measurements for Milwaukee's Giannis Antetokounmpo). While still very slight, Durant was a hair stronger and taller than Ingram at the same age. Durant had more quickness and pop as a leaper as well. From a pure numbers standpoint, Ingram has the slight edge on Durant. He made more threes per 40 minutes while shooting a better percentage and produced more points per possession while taking 37 more catch-and-shoot jumpers. In terms of mechanics and value as a catch-and-shoot player, Durant has the edge. It wasn't difficult to see Durant evolving into one of the best shooters in basketball. He had NBA range as an 18-year-old and was a more versatile shooter than Ingram with better skill coming off screens and dribble handoffs. Ingram certainly shows a lot of promise, but he doesn't quite display the same range, touch and shot-making ability that Durant did. Ingram flashed a lot of potential as a one-on-one shot creator, scoring 0.94 points per possession to Durant's 0.88 in isolation situations. Ingram's shooting stroke sets up the drive, and he has very advanced footwork for his level of development. Neither player was particularly efficient shooting off the dribble, but Durant was more advanced, regularly using hesitation pull-ups, crossovers and step-backs to create space. Durant was also a little bit quicker off the bounce, playing with solid burst while shifting gears seamlessly. Ingram is often criticized for not being able to turn the corner in shot-creation situations, an issue that Durant also dealt with at times because of his size. As Ingram continues to mature physically, he should be able to keep his defender on his hip and stride all the way to the rim. Durant was as prolific of a one-on-one scorer as you'll see from an 18-year-old. Ingram certainly isn't as advanced as Durant was, but he has a nice foundation to build on. This season Durant has used more pick-and-roll possessions than any other play type and ranks in the 90th percentile in points per possession. Yet as an 18-year-old freshman, pick-and-roll ballhandling made up only 3.1 percent of his offense, yielding 0.542 points per possession. Statistically at least, Ingram is further ahead as a pick-and-roll player. He has room to improve his pull-up game and creativity attacking the rim (he only scored 0.716 points per possession out of ball screens), but Ingram can make a three if the defense goes under the screen, get into the mid-range if the guard fights over, and stride to the rim if he finds a seam. Maybe the most impressive part of his pick-and-roll game is his potential as a passer. He plays with great pace, can see over the top of the defense and handles defensive pressure well. Ingram may not have Durant's upside as a pick-and-roll player, but he's slightly more versatile operating off ball screens at the same level of development. Both Ingram and Durant weren't great around the rim as freshmen because of their lack of strength. Durant is a better leaper off one foot and was able to drop in floaters from different angles. That's a shot Ingram doesn't have at this stage. Ingram is more of a two-feet jumper around the rim, gathering himself even when he has a straight line to the rim. On the positive side, Ingram doesn't shy away from contact even with his thin body. He has not reached his athletic potential and yet is very good with his left hand around the rim. He'll benefit from continuing to get craftier around the rim to make up for his lack of pop. Durant's post game was extremely polished for a freshman; Ingram didn't spend a whole lot of time on the block. Durant was lethal shooting turnarounds over either shoulder, as his high, often variable release point was nearly impossible to block. Durant also had a counter to his fall-away and could face up and attack from the mid-post as well. Ingram has impressive footwork and can make a turnaround over either shoulder, but he isn't on the same level as Durant as a post scorer. Durant and Ingram differ in their offensive approach. Durant was a mega-scorer who could and would score from anywhere on the court. Ingram is much more naturally unselfish. Durant had vision as a freshman and has developed into a tremendous passer, averaging 5.5 assists per 40 minutes this season. Ingram has shown flashes of taking over, but his passing and feel for the game might end up being almost as valuable as his scoring ability down the road. All in all, Ingram isn't the same level of prospect that Durant was despite having many similarities. With that said, Ingram has come a long way over the past 18 months, and with his physical tools and foundational skill set, he is, in our view, the top prospect in the 2016 NBA draft. Analyzing how Brandon Ingram and Brice Johnson fared in their head to head matchups in Duke's road win at North Carolina last night. While both Johnson and Ingram are primary offensive options for their teams, who spend most of their time at the power forward position, they are completely different players. Their coaches used very different strategies throughout the night to counter their strengths and weaknesses, and they weren't always guarding each other or involved in plays their counterpart made. Johnson spent quite a bit more time defending Ingram than the other way around. We only looked at possessions where the two were directly matched up head to head. Brandon Ingram has gotten off to an outstanding start to the season, posting a very strong 20.6 points (53% 2P%, 41% 3P%), 8.2 rebounds, 2.3 assists, 1.9 blocks and 1.4 steals per-40 minutes. Considering he's more than a year younger than Ben Simmons, Ingram has shown he's a worthy candidate as the potential #1 pick in the draft this upcoming June. From an NBA scouting perspective, one of the most intriguing games Duke has played thus far was against Louisville on February 8th at Cameron Indoor in Durham. Louisville sports the #2 defense in all of college basketball according to KenPom, and had a variety of different types of defenders they could throw at Ingram to keep him off balance. Ingram put both his strengths and weaknesses on full display there, scoring 18 points (3/4 2P, 2/5 3P, 6/8 FT) to go along with 10 rebounds, 4 assists and 3 turnovers in 40 minutes. Via Mike Schmitz, here's an five minute video breakdown of some of the more notable things NBA scouts were able to see from Ingram in that game, both good and bad, on either end of the floor. Ingram struggled with foul trouble as well, being the victim of a number of questionable calls that prevented him from getting into any kind of offensive groove. In spite of that, he showed how tantalizing a prospect he can be with his unique combination of size, length, fluidity, ball-handling ability and body control. Ingram is still at a very early stage of his development physically, skill-wise and in terms of his overall awareness and feel for the game. He shows great flashes in many different areas, but has a difficult time putting everything together consistently. The makeup of this Duke team, with their poor spacing caused by their duo of interior oriented big men, and a lack of playmakers, certainly exacerbates this issue. When Ingram was at his best, he was creating his own shot impressively on the perimeter, changing speeds, showing impressive footwork, and finding teammates off the dribble. That was mixed in with bad shots, settling for a long, contested 2-pointer off the dribble, and getting burned off the dribble by Kentucky's significantly smaller combo guards. Even though Ingram has tremendous potential defensively with his 7'3 wingspan and impressive instincts getting in the passing lanes and block shots, and showed as much with some very nice plays around the basket, he is still too inexperienced and lackadaisical with his overall approach, especially on the perimeter. This was far from a vintage performance, but Ingram still showed his significant talent, which is impressive considering how poor his boxscore line looks on paper. Mike Schmitz kicks off our coverage of the top NBA prospects in the SEC with a video scouting report of the #1 prospect in the conference, Duke's Brandon Ingram. Although he didn't get a ton of looks in 26 minutes, Ingram was the US Team's most efficient player as he showed his versatile skill set and potential on the offensive end. Ingram knocked down a spot up mid-range jumper, hit two pull up jumpers, got the defender up in the air on the perimeter with a head fake, and got to the rim in a straight line and finished. He also got to the line off of a straight line drive going right. Ingram is very skilled and has excellent size and length for wing  6' 9.5 with a 7' 3 wingspan. He has a lot of work to do on his body and can improve his overall effort level but there's a lot to like about Ingram, and he showed why on Saturday. 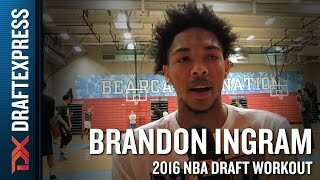 An interview with elite forward prospect Brandon Ingram of the USA Junior National Select Team at the 2015 Nike Hoop Summit. Small forward Brandon Ingram certainly looks the part of a high upside small forward prospect registering the 2nd longest wingspan on this roster with a frame that has a lot of potential for growth. His wingspan ranks among the most impressive wingspans for a small forward in our extensive database. His standing reach is equally impressive, ranking just a half an inch below that of Kevin Durant who measured 6-10.25 in shoes with a 7-4.75 wingspan and a 215-pound frame in 2007. Ingram's frame will need a lot of work at 196 pounds, but his height, wingspan and standing reach are phenomenal for a wing player. Video, Highlights, and Interview courtesy of 312 Media.